The MS2711B also features several dedicated one-button measurements that make testing cellular, DCS/PCS and WLAN systems among other wireless systems easier than ever before. 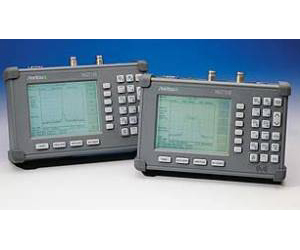 Measurements include channel power, adjacent channel power ratio, and occupied bandwidth measurements that can confirm the distortion level or channel power level of an AMPS, TDMA, CDMA or GSM transmitter. Additionally, the MS2711B can conduct a series of spurious measurements when analyzing a wireless base station transmitter, while the field strength mode allows users to measure propagation and coverage, or to pinpoint electromagnetic (EM) leakage in broadcast systems. Other new features include trace averaging for more accurate noise measurements; a multilingual user interface with on-screen menus and messaging in 6 different languages; and a 50-ohm interface that is adaptable to 75-ohms, enabling users to conduct measurements of 75-ohm systems without sacrificing measurement accuracy. The MS2711B includes data analysis software, soft carrying case, rechargeable/field-replaceable battery, AC/DC power supply, and 12.5V automobile cigarette lighter adapter and users guide.